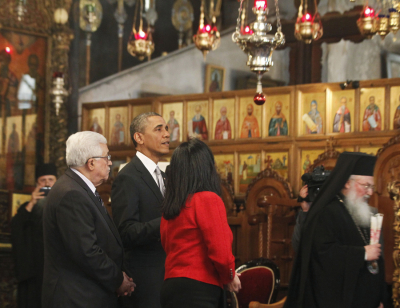 President Obama toured the Church of the Nativity, believed to be the birthplace of Jesus Christ, with Palestinian Authority President Mahmoud Abbas on Friday, the last day of his three-day visit to Israel and the Palestinian Territories. The Patriarch of Jerusalem welcomed Obama as "a messenger of peace and reconciliation." Welcoming Obama to the "place where heaven and earth met," the Greek Orthodox Patriarch of Jerusalem Theophilos III called him "a messenger of peace and reconciliation," and then quoted the Beatitudes in part, saying "Blessed are the peacemakers," according to the White House pool report. However, some were unhappy with Obama's visit. "Gringo, return to your country," read a sign held by a small group of Palestinian protesters who watched the presidential motorcade roll into Bethlehem from Jerusalem after it passed through Israel's barrier in the West Bank. A windstorm had forced Obama to travel from Jerusalem to Bethlehem by motorcade instead of helicopter. President Abbas was with Obama as he toured the historic church that was granted the world heritage status by UNESCO last year, which was hailed as "the beginning of the end of the Israeli occupation." In a courtyard, about 20 children in white shirts and dark pants waved U.S. and Palestinian flags as Obama emerged from the sanctuary. He posed with Abbas, the mayor of Bethlehem, and the children for photographs, even as priests clad in black robes looked on. On Thursday, when Obama was in the West Bank city of Ramallah, he urged Abbas to return to peace talks with Israel unconditionally, although the Palestinian leader has insisted that Israel stop its settlement activity in the West Bank before they talk. Prior to his visit to the Church of Nativity on Friday, Obama paid tribute to the victims of the Holocaust at the Yad Vashem memorial, located on the western slope of Mount Herzl on the Mount of Remembrance in Jerusalem. At the memorial, Obama spoke of "the depravity to which man can sink; the barbarism that unfolds when we begin to see our fellow human beings as somehow less than us, less worthy of dignity and of life." "We see how evil can, for a moment in time, triumph when good people do nothing, and how silence abetted a crime unique in human history," said Obama, who was accompanied by Israeli Prime Minister Benjamin Netanyahu and President Shimon Peres. "Here we see their faces and we hear their voices. We look upon the objects of their lives – the art that they created, the prayer books that they carried. We see that even as they had hate etched into their arms, they were not numbers. They were men and women and children – so many children – sent to their deaths because of who they were, how they prayed, or who they loved." Obama said the memorial also shows "man's capacity for good – the rescuers, the Righteous Among the Nations who refused to be bystanders. And in their noble acts of courage, we see how this place, this accounting of horror, is, in the end, a source of hope. "… We have the choice to acquiesce to evil or make real our solemn vow – 'never again.' We have the choice to ignore what happens to others, or to act on behalf of others and to continually examine in ourselves whatever dark places there may be that might lead to such actions or inactions. This is our obligation -- not simply to bear witness, but to act." Obama added that racism, especially anti-Semitism, has no place in the civilized world, "not in the classrooms of children; not in the corridors of power." Obama used the occasion to urge Israelis to look at suffering in the Palestine. "Put yourself in their shoes – look at the world through their eyes," he said. "It is not fair that a Palestinian child cannot grow up in a state of their own." The president also appeared to respond to criticism for his 2009 Cairo speech where he used the example of the Holocaust alone to justify Israel's existence. "Here, on your ancient land, let it be said for all the world to hear: The State of Israel does not exist because of the Holocaust. But with the survival of a strong Jewish State of Israel, such a Holocaust will never happen again," Obama said Friday. The president also paid tribute to heroes of the Jewish state, visiting the graves of Theodor Herzl, the founder of modern Zionism, and Yitzhak Rabin, the Israeli prime minister who was assassinated in 1995. Obama's visit to and vocal support of Israel comes at a time when tensions between Israel and Iran are growing over the latter's nuclear ambitions.